Cherry and Apple pies are American classics, my inspiration for this quick and easy Independence Day dessert. 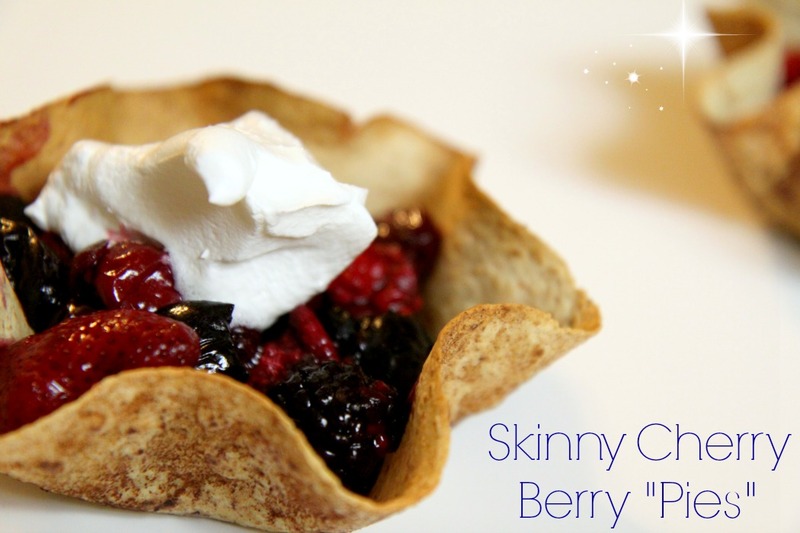 Skinny Cherry Berry “Pies” made from a frozen cherry berry blend bag with blueberries, strawberries, raspberries, blackberries and cherries. Summertime fruit is like candy! Sweet, single-serve, and perfectly Red, White & Blue(berry). These are skinny mini single-serve “pies” that aren’t pies at all but totally pass as dessert because they are warm and cute. 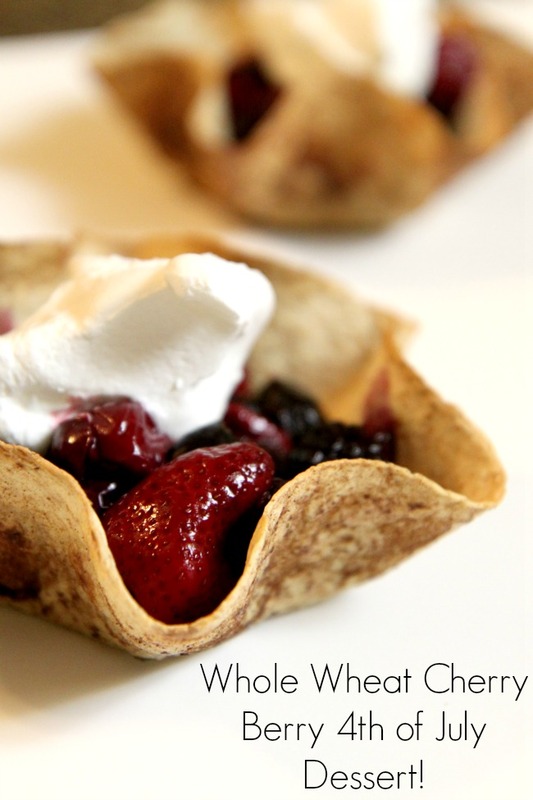 The bowl is made out of a whole wheat tortilla (50 calories) lightly sprayed with Pam and sprinkled with cinnamon-sugar. It bakes in the bowl for 7 minutes before cooling, while the cherry berry blend warms up in the oven. My favorite part – the warm berry juice! Messssssy. Total: approximately 150 calories. Average slice of apple pie with ice cream, on the other hand? 530 calories. If you plan on hitting up the beach or pool this weekend, you’ll be thankful for the alternative to a heavy apple pie a la mode. Fresh/frozen fruit + whole grains, not only are they bikini-approved but the antioxidants will help protect your skin from damaging elements….but don’t forget your sunscreen! Time to catch the latest episode of “American Ninja Warrior”…that’s true patriotism right there. Posted on July 4, 2013, in Dessert and tagged berry, Dessert, fourth of july, Fruit, healthy, summer. Bookmark the permalink. 7 Comments. Happy 4th of July, your pie looks yummy. Have a great 4th and say hi to Mom & Dad. In my hometown we ran the Peachtree Road Race today to celebrate America. If you’re ever in Atlanta, you really should try it. It’s 6.2 miles of pure fun, not so much a race for time as it is a celebration of our country (though you can be seeded – Kenyans or Ethiopians usually win with ridiculous times, and the winner in each division gets $60,000 dollars, so that’s pretty cool). The mini pies sound so yummy – thanks for sharing! It’s cool that they’re still healthy and easy to make. Can’t wait to try!